Ritualism, in the history of Christianity, refers to an emphasis on the rituals and liturgical ceremony of the church, in particular of Holy Communion. In the Anglican church in the 19th century, the role of ritual became a contentious matter. The debate over ritual was also associated with struggles between High Church and Low Church movements. In Anglicanism, the term "ritualist" is controversial (i.e. rejected by some of those to whom it is applied). It was often used to describe the second generation of the Oxford Movement/Anglo-Catholic/High Church revival of the 19th century which sought to reintroduce into the Church of England a range of Catholic liturgical practices. The term is also used to describe those who follow in their tradition. Arguments about ritualism in the Church of England were often shaped by opposing (and often unannounced) attitudes towards the concept of sola scriptura and the nature of the authority of the Bible for Christians. is beautiful and an expression of the human response to God that calls on humans to offer their best in worship – a way of expressing the value ("worth") that they place on God : worship is, etymologically, "worth-ship"
has often impeded the understanding of the gospel by wrapping up Christian worship in indecipherable symbolic acts. The development of ritualism in the Church of England was mainly associated with what is commonly called "second generation" Anglo-Catholicism, i.e. the Oxford Movement as it developed after 1845 when John Henry Newman left the Church of England to become a Roman Catholic. Some scholars[who?] argued that it was almost inevitable that some of the leaders of Anglo-Catholicism turned their attentions to questions of liturgy and ritual and started to champion the use of practices and forms of worship more commonly associated with Roman Catholicism. There was only limited enthusiasm amongst ritualists to introduce the widespread use of Latin in the liturgy. The leaders of the first generation of the Anglo-Catholic revival or Oxford Movement (e.g. Newman, Edward Bouverie Pusey, and John Keble) had been primarily concerned with theological and ecclesiological questions and had little concern with questions of ritual. They championed the view that the fundamental identity of the Church of England was Catholic rather than Protestant. They had argued that Anglicans were bound by obedience to the use of the Book of Common Prayer. "Tract 3" of the Tracts for the Times series had strenuously argued against any revision of the Book of Common Prayer, viewing its use as a matter of absolute obligation. Even Tract 90, which analysed the 39 Articles, was more concerned with the theological dimension of the issue. It gave little attention to the question of altering current liturgical practice in the Church of England. The ecclesiological questions gave rise to an interest in giving liturgical expression to the theological conviction that the Church of England had sustained a fundamentally Catholic character after the English Reformation. In some circles, the shift of focus to the question of liturgy proved as provocative as had been the theological assertions of the first generation of Anglo-Catholicism. The clearest illustration of the shift that took place within Anglo-Catholicism from theological to liturgical questions is to be found in Pusey's attitude towards ritualism. Pusey, the only pre-eminent first-generation leader of Anglo-Catholicism to survive into the second generation, had no sympathy with the preoccupation with ritual. However, when priests started to be prosecuted and imprisoned as a result of the Public Worship Regulation Act 1874, Pusey was quick to show his support for those who were prosecuted. the use of Catholic terminology such as describing the Eucharist as the "Mass"
In regard to the "North Side" celebration. At the time of the Reformation, altars were fixed against the east end of the church, and the priests would celebrate the Mass standing at the front of the altar. Beginning with the rubrics of the Second Prayer Book of Edward VI published in 1552, and through the 1662 Book of Common Prayer (which prevailed for almost 300 years), the priest is directed to stand "at the north syde of the Table." This was variously interpreted over the years to mean the north side of the front of a fixed communion table, the north end of a fixed table (i.e., facing south), the north side of a free-standing table (presumably facing those intending to receive the Elements who would be sitting in the quire stalls opposite), or at the north end of a free-standing table lengthwise in the chancel, facing a congregation seated in the nave. If the last option then it would copy the practice of the Early Church when the celebrant stood before a small stone or marble table, usually rectangular, facing the nave. the use of robed choirs seated in the chancel accompanied by pipe organ rather than by a Church band and seated in a west gallery at the back of the church. The prosecution and conviction of Arthur Tooth in 1876, Sidney Faithorn Green in 1879 and Richard William Enraght in 1880 are good illustrative examples of the kind of issues that could be involved in controversies caused by these liturgical practices. The prosecutions (which were often instigated by the Church Association) gave considerable impetus to the foundation and work of the English Church Union. 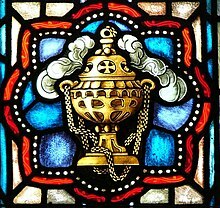 The Society of the Holy Cross (SSC) played a crucial role in championing and developing the use of elements of proscribed Catholic ritual in Anglicanism. For many who opposed ritualism, the key concern was to defend what they saw as the fundamentally Protestant identity of the Church of England. Nor was this just a matter of an ecclesiological argument: for many, there was a sense that Catholic worship is somehow "un-English". Catholicism was deeply associated in many minds with cultural identities which, historically, many English people had commonly treated with suspicion, especially the Spanish, the French, and the Irish. For an ideological defence of this position, it was argued that English identity was closely tied in with England's history as a Protestant country that, after the Reformation, had played a key role in opposing Catholic powers in Continental Europe (especially Spain and then France). In the minds of such people, Protestantism was inextricably identified with anti-despotic values and Catholicism with autocracy that, in the religious arena, hid behind the "disguise" of such things as complicated rituals whose meaning deliberately lacked transparency. The opposition to ritualism therefore had a deeply cultural and symbolic significance that extended far beyond purely theological concerns. Ritualists themselves were often at pains to try and present the "Englishness" of the ritual they championed by (mostly) keeping English as the language of the liturgy and reconstructing Anglo-Catholicism as a recovery of pre-Reformation Catholic forms that were specifically English: a revival of interest in the Sarum Rite (the pre-Reformation Catholic liturgy of Salisbury) was sparked off by the Ritualist movement. This tendency was also often expressed in such details as the revival in the use of the pre-Reformation Gothic forms rather than the Baroque – the Baroque was more closely linked in the minds of many with specifically continental and Counter Reformation forms. Although ritualism had an aesthetic and ideological appeal for many in the cultural elite, and had a cognate relationship with the Gothic Revival, the idea that it was inextricably linked with an inclination towards political despotism was a misapprehension. Ritualism had an appeal for many who were politically conservative and had supporters highly placed in the establishment (e.g. Viscount Halifax and the 4th Marquess of Bath). However, the outlook of many of the ritualist clergy themselves, many of whom inevitably operated in some of the most deprived communities in England, resulted in their becoming politically radicalised by the experience – some became ardent Christian Socialists. In the spectrum of hostility that it aroused, ritualism also provoked in some of its opponents a reaction that saw its theatricality and its aestheticism as symptoms of "effeminacy". A typical charge was that ritualistic clergy were "man milliners", more concerned with lace and brocade than doctrine. Adverse reaction to this played a significant role in the evolution of the Broad and Low Church enthusiasm for "muscular Christianity". One of the key ideological justifications used by many of the early ritualists, apart from the fact that it was a symbolic way of affirming their belief in the essentially Catholic nature of Anglicanism, was the argument that it provided a particularly effective medium for bringing Christianity to the poorest, "slum parishes" of the Church of England. It was argued that ritual and aesthetically impressive liturgy did not only provide a powerful contrast to the drabness of the lives of the poor, its emphasis on symbol and action rather than word was a more effective medium for spreading Christian faith in areas with poor literacy rates than the highly cerebral and logocentric worship that was focused on the Book of Common Prayer. This argument may have had some merits, but, very often, the respect that the most successful ritualists often gained in the highly impoverished communities they went to serve was based on the fact that they had expressed a genuine pastoral concern for the poor amongst whom they lived. The argument for ritualism in Anglicanism was also based on the analogy of the success of the Roman Catholic Church amongst the highly impoverished Irish migrant communities in the urban areas of England – it was argued by some that ritual played a key role in the growth of the Roman Catholic Church amongst the poor. However, the use of ritual probably played little more than a subsidiary role in the success of the Catholic Church in this area: its success was probably largely due to a special cultural identity that many Irish migrants felt with the Roman Catholic Church as one of the few institutions that they encountered in diaspora that was also a feature of life in their homeland. Edward King, Bishop of Lincoln, by Leslie Ward 1890 – King was prosecuted for ritualist practices. The ritualists use of vestments and wafer bread have become widespread, even normative, in the Church of England for much of the 20th century. Although many members of the Church of England today still feel uncomfortable or sceptical about certain 'Catholic' or 'Romish' liturgical practices, they would be astonished to be told that, in the late 19th century, using incense, wearing vestments, putting candles on the altar, the mixed cup, making the sign of the Cross over the congregation, and using unleavened (wafer) bread in the Eucharist could spark riots, put priests in prison and even led in 1888–90 to the prosecution of a bishop – Edward King, Bishop of Lincoln. The lasting legacy is that the Ritualists won: the current liturgical style in its various manifestations in almost all Anglican parishes world-wide is much closer to the way Mass was celebrated 500 years ago even in Low Church and 'mid-range' parishes. What offended so many 150 years ago are the new norm and even fewer seem to care or even know about past fights. Neo-Gothic "solar" monstrance used for Benediction. ^ David Hilliard: "UnEnglish and Unmanly: Anglo-Catholicism and Homosexuality": Victorian Studies: (Winter 1982): 181–210. David Hilliard: "UnEnglish and Unmanly: Anglo-Catholicism and Homosexuality": Victorian Studies: (Winter 1982): 181–210. Frank Reynolds: Martyr of Ritualism: Father MacKonochie of St Alban's, Holborn: London: Faber and Faber, 1965. Herbermann, Charles, ed. (1913). "Ritualists" . Catholic Encyclopedia. New York: Robert Appleton Company.